Gordon Jacob in the 1950s. It might surprise you to know that the French horn isn’t French at all. It was actually invented in Germany so the name “German horn” would probably be more appropriate. In any case, the name “French horn” is used only by English speakers. Everyone else simply calls it a horn. And in case you were wondering, it has nothing to do with the English horn which is neither English nor a horn. The earliest horns date back to antiquity, made from animal horns such as those of rams or cattle. They could play only a few notes and were used for signaling rather than for musical purposes. The hunting horn has existed since medieval times and for ease of use, it was made like a hoop, a shape that has persisted in orchestral horns to this day. There’s another reason for the hoop shape. If you had the time and inclination to uncoil a modern horn, it would be about twelve feet long. The orchestral horn appeared during the seventeenth century when the most important horn makers were based in France. By modern standards they were simple instruments: a mouthpiece, a hoop of brass tubing and a flared bell. They had a limited range of notes until someone came up with the idea of adding extra coils of tubing (called crooks) to increase the overall length and therefore the pitch. It was not until the early nineteenth century that valves and the instrument’s design were developed in Germany. There are several types of horn, although from a distance most of them look similar. The standard instrument is the German horn (known as the French horn) which has three lever-operated rotary valves. Most orchestral players use an instrument known as a “double horn” which employs a fourth valve to open a separate set of tubes. There is also the genuine French horn, but you don’t see them very often. It has three trumpet-like pistons to control the valves. Then there’s the Vienna horn which is used in Vienna and nowhere else and uses rather complicated valves. During the twentieth century, instrument makers developed a horn for marching and it looks like a large trumpet. Strangely enough, the horn never caught on as a jazz instrument although for some reason jazz musicians refer to all wind instruments as horns. The most well-known horn concertos are the four by Mozart and the two by Richard Strauss. The horn concertos by Gordon Jacob and Reinhold Glière are the most popular twentieth century examples. 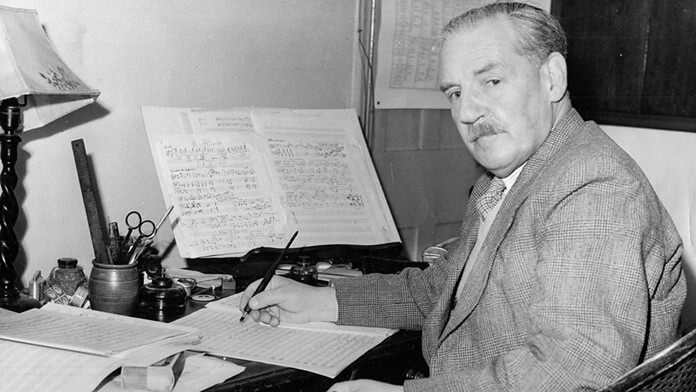 There’s an interesting coincidence too; the Jacob concerto was first performed in London on 8th May 1951 and the Glière work was premiered in Leningrad two days later. The work was written for the legendary British horn player Dennis Brain who at the time was the most sought-after horn player in the country. His 1953 recordings of the Mozart horn concertos, which he played from memory, are still considered to the finest ever made. Like the conductor Herbert von Karajan, Dennis Brain had a passion for cars. He famously always kept the latest edition of the magazine Autocar on his music stand at concerts and recording sessions. Sadly, Dennis Brain lost his life at the age of thirty-six in a car accident. At the time, he was driving home in his Triumph TR2 sports car when it left the road and collided with a tree. Reinhold Glière was born in the Russian city of Kiev to a German father and a Polish mother. According to his birth certificate, his original name was Reinhold Glier. For reasons best known to himself, in 1900 he changed the spelling and pronunciation of his surname to Glière giving rise to the legend that he was of French or Belgian descent. Perhaps that was his intention. Along with his famous ballet The Red Poppy, this three-movement concerto is one of the composer’s most acclaimed works. It has some splendid writing and full of lovely melodies. It has another thing in common with the Gordon Jacob concerto, rather than looking forward in its musical style it looks back towards a bygone age.